Engineering is the E in STEM jobs (Science, Technology, Engineering, Math) but there are many different kinds of engineering. If you, or one of your kids, or a family member plan to make the sizeable investment in an engineering degree, you’ll want to know which one really brings home the bacon. 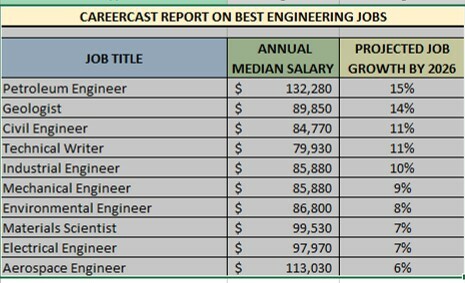 Fortunately, CareerCast’s most recent report on The Best Jobs in Engineering does that analysis for us. The report highlights the three most financially lucrative fields of study for bachelor’s degree recipients ages 25-to-29 – the young people just out of school—are Electrical Engineering ($74,790); Mechanical Engineering ($71,860); and other Engineering disciplines ($65,480). If you’re smart and looking beyond today’s salary to job security and a real career, then you need to look at projected job numbers. 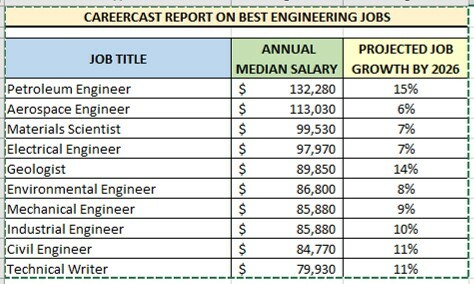 For this metric, CareerCast reports the lowest unemployment rates among recent graduates are for engineering students. Electrical Engineering was 3.3%, assorted other Engineering disciplines 2.3%, and Mechanical Engineering 1.9%. The good news is that all engineering jobs have positive growth rates. The CareerCast report shows that all of the 10 Best Jobs in Engineering rank in the top 72 overall across all industries and titles evaluated for 2018. Still, some disparities really puzzle me. I understand the high salary for a Petroleum Engineer today but not the high projected growth rate. At a time when countries around the world—including Saudi Arabia—are looking to diversify the energy sources they depend on, I would expect to see a much lower growth rate. On the flip side, Environmental Engineer might not get much monetary respect today but that should be going up as climate change really kicks in. Even the reluctant United States is being forced to pull its head out of the sand and deal with real environmental problems. So why the low growth rate? Neither of these numbers makes sense to me given our current economic and environmental trends. 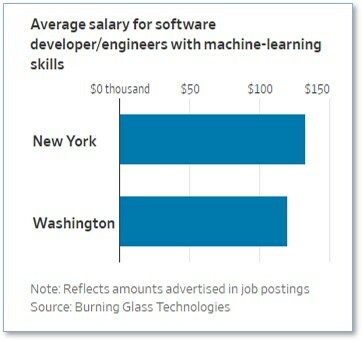 Given our pressing need to improve America’s infrastructure, I would expect Civil Engineering salaries to go way up between now and 2026—if we can get past politics to accomplish some actual work. At the same time, prospective engineering majors might want to consider a third factor: the location of those jobs. Amazon is poised to move 25,000 jobs each to Queens, New York and Crystal City near Washington DC. 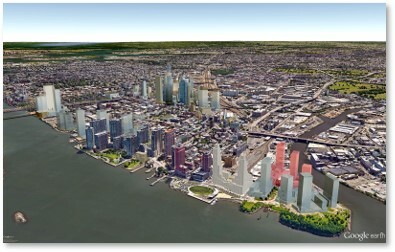 Google plans to double its work force in the Big Apple by another 7,000 jobs. Amazon and Google might also have some trouble moving young people who value quality of life in to already-crowded urban areas. Yes, they prefer cities but not all urban locations are equally attractive. Long Island City in Queens, where half of Amazon’s HQ2 will be located, is no one’s idea of a hip place to live. It’s served by an already-crowded subway train and the site is right next to the largest public housing unit in the country. Plus, it’s located right on the water, something an environmental engineer might discourage,. Just getting from the new Amazon campus to LaGuardia for one of those important non-stop flights to Seattle will be a nightmare. New York real estate, whether purchased or rented, already costs more than a mansion in other parts of the country. And then there’s the dirt and congestion. Will it work? Only the young engineers will know for sure and they will vote with their feet. So, there you have it: a look into the future for engineering students of all types. You can think about salaries, growth prospects and quality of life. Build an algorithm and make your choices.